Perirenal hematoma after extracorporeal shock wave lithotripsy (ESWL) is an unusual but underdiagnosed complication. Most hematomas are asymptomatic, but severe complications are possible, which may require intervention such as a blood transfusion. We present the case of a 41-year-old Asian man suffering from a symptomatic huge perirenal/subcapsular hematoma with scrotal hematoma after ESWL; we reviewed the literature and examined the possible risk factors and treatments. This case was a very rare presentation of hematoma extension into the scrotum region from an ipsilateral perirenal hemorrhage caused by shock wave lithotripsy treatment. Extracorporeal shock wave lithotripsy (ESWL) has been widely used in medical practice since the 1980s. Owing to its noninvasive approach, it has become one of the main treatment options for patients with renal and ureteral calculi. Although it has been considered a safe treatment modality, uncommon complications can occur, such as perirenal hematoma and hematocele of the scrotum, which may be severe and life-threatening. Few cases have been reported according to our literature review. Thus, we present a case of perirenal hematoma and hematocele after ESWL, a review of associated articles, and a discussion of the possible risk factors and treatments. A 41-year-old Asian man with no history of systemic disease or coagulopathy visited our emergency room due to right flank colic pain. A film of the kidney, ureter, and bladder (KUB) showed a ureteral calculus, 0.6 cm in size, in the upper third at the L4–L5 level on the right side, in addition to a renal stone of the low pole on the right side. The patient underwent ESWL for the right ureteral stone the next day. About 3 weeks later, the patient returned for management of the right renal stone. A KUB film showed no visible ureteral stone impaction, and therefore, the patient underwent subsequent ESWL for the treatment of the right renal stone. The stone was of a round shape, with a diameter of 1.47 cm, located at the right lower pole of the kidney. It was treated using a MEDISPEC ECONOLITH 2000 lithotripter, by which 3000 shocks were delivered to the stone at a rate of 1 per second, at an energy of 14 kv initially, reaching 18 kv. The patient was then discharged from the recovery room. Approximately 8 h after ESWL, he presented to the ER with a complaint of severe right flank pain with gross hematuria. Physical examination revealed right flank ecchymosis. A KUB film showed a fragmented right renal stone, and the patient was treated with pain control and intravenous fluid hydration and then discharged. The next morning, he noticed that the right flank pain had not improved, and the area of ecchymosis was extended. He then visited our outpatient department, at which point the ecchymosis of the right flank region, of an estimated 15 cm × 12 cm in size, was noted to have spread from the right subdiaphragm to the ipsilateral costovertebral angle. In addition, the ecchymosis had spread over the penile skin and the scrotum [Figure 1]a and [Figure 1]b. A palpable mass in the right scrotum was noted, without marked tenderness but with a swollen sensation. A drop in the level of hemoglobin was also noted from 18.5 g/dL before ESWL to 11.3 g/dL after the procedure. 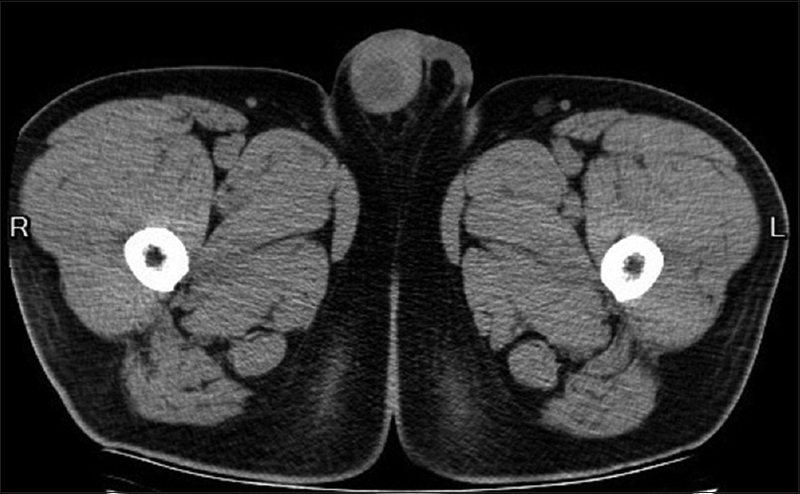 Thus, emergency computed tomography (CT) of the abdomen was performed, which showed a huge right-side perirenal hematoma [Figure 2]. The hematoma extended downward along the retroperitoneal space to the ipsilateral inguinal canal, and then to the scrotum, causing hematocele formation [Figure 3]. The patient was admitted for further monitoring. During hospitalization, conservative treatment was maintained, and the patient's vital signs were monitored; no signs of hemorrhagic shock emerged, and the area of ecchymosis did not progress. No blood transfusion was given during the period of admission. After several days of treatment, the patient was discharged in a stable condition. 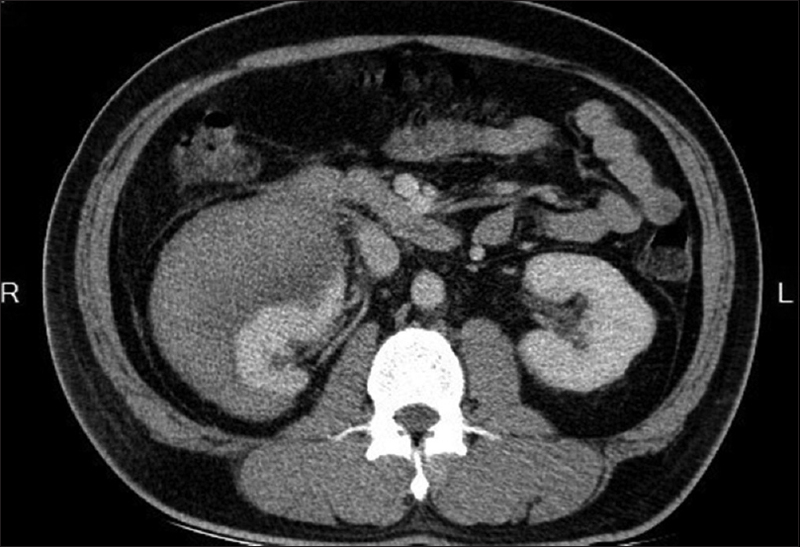 During the outpatient department visits 3 and 6 months later, abdominal contrast CT was performed, which revealed that the perirenal hematoma and the hematocele had shrunk, and there were signs of liquification. The swollen sensation in the right scrotum still persisted at 3 months but had improved at 6 months. Written informed consent to publish this case report was provided by the patient, and the consent procedure was approved by the Ethics Committee of Tri-Service General Hospital. Several studies have been conducted to assess the possible risk factors and complications after ESWL. A study by Lee et al. included a total of 10,887 treatment episodes in 6,177 patients who underwent ESWL for urolithiasis. Subcapsular or perirenal hematoma developed in 20 patients, resulting in an overall incidence of 0.32%. All of the patients received conservative and supportive treatment without surgical exploration. There are several contraindications of ESWL treatment including pregnancy, an untreated urinary tract infection/urosepsis, decompensated coagulopathy, uncontrolled arrhythmia, and an abdominal aortic aneurysm >4.0 cm. The majority of patients can be managed conservatively with admission for pain control, supportive care, and observation; however, the treatment should be individually tailored. The severity of hematomas may necessitate blood transfusion or urgent intervention including renal embolization or even nephrectomy. Spontaneous resorption of the hematoma may take 6 weeks to 6 months., Another study included 21,699 lithotripsies in a total of 10,953 patients; 31 (0.28%) renal hematomas were diagnosed, and all patients received conservative treatment without surgical exploration. This study also reported that the presence of a hematoma is not a contraindication for further treatment of residual stones. Lee HY, Yang YH, Shen JT, Jang MY, Shih PM, Wu WJ, et al. Risk factors survey for extracorporeal shockwave lithotripsy-induced renal hematoma. J Endourol 2013;27:763-7. Streem SB. Contemporary clinical practice of shock wave lithotripsy: A reevaluation of contraindications. J Urol 1997;157:1197-203. Tailly GG. Management of acute post ESWL complications. Česká Urol 2000;4:5-8. Knapp PM, Kulb TB, Lingeman JE, Newman DM, Mertz JH, Mosbaugh PG, et al. Extracorporeal shock wave lithotripsy-induced perirenal hematomas. J Urol 1988;139:700-3. Newman LH, Saltzman B. Identifying risk factors in development of clinically significant post-shock-wave lithotripsy subcapsular hematomas. Urology 1991;38:35-8. Dhar NB, Thornton J, Karafa MT, Streem SB. A multivariate analysis of risk factors associated with subcapsular hematoma formation following electromagnetic shock wave lithotripsy. J Urol 2004;172:2271-4. Willis LR, Evan AP, Connors BA, Handa RK, Blomgren PM, Lingeman JE, et al. Prevention of lithotripsy-induced renal injury by pretreating kidneys with low-energy shock waves. J Am Soc Nephrol 2006;17:663-73. Rubin JI, Arger PH, Pollack HM, Banner MP, Coleman BG, Mintz MC, et al. Kidney changes after extracorporeal shock wave lithotripsy: CT evaluation. Radiology 1987;162:21-4. Silberstein J, Lakin CM, Kellogg Parsons J. Shock wave lithotripsy and renal hemorrhage. Rev Urol 2008;10:236-41. Collado Serra A, Huguet Pérez J, Monreal García de Vicuña F, Rousaud Barón A, Izquierdo de la Torre F, Vicente Rodríguez J, et al. Renal hematoma as a complication of extracorporeal shock wave lithotripsy. Scand J Urol Nephrol 1999;33:171-5.